"Talk less, eat less, sleep less"—that's the self-mantra of Dada J.P. Vaswani, spiritual head of the Sadhu Vaswani Mission, based in Pune, but with its work spread across the world. 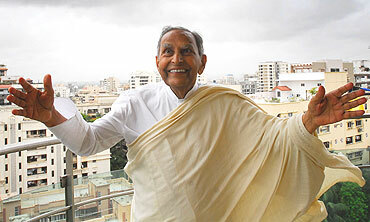 Dada Vaswani's agility and energy belie his age. He's touching 90, but his punishing schedule includes waking up at 4 am, meditating for over two hours, taking a morning walk, doing yoga and physical exercises, followed by a kirtan session, public meetings, writing, replying to mail, and visiting schools and colleges run by his mission. Then he conducts a satsang, followed by another meditation session and a spiritual talk. He also makes the time to attend meetings, deal with administrative work and hold another small kirtan session before his day ends. Bedtime is around midnight. Dada's legion of followers are full of excitement that he will turn 90 on August 2, but for Vaswani himself, it's just one more milestone in a life that has seen several of them. He lives his life the way he always has—learning, teaching, and spreading the message of love and unity. His dream, if it may be called that, is to see the Sadhu Vaswani Mission grow stronger, set up more schools, colleges and hospitals, and be there for all those who need its services. The Sadhu Vaswani Mission, earlier known as the Sakhi Satsang, Sind, was founded by his revered guru, uncle and educator, Sadhu T.L. Vaswani. The mission functions in the belief that "there is but one life in all men, birds, animals, things, animate and inanimate". The mission's activities include education of the girl child; providing daily meals to the poor, feeding birds and animals every day, vocational training programmes for women, emergency relief and rehabilitation during natural calamities, and village uplift programmes. At its state-of-the-art medical complex in Pune, the poor are offered superspeciality treatment for free or at a nominal cost. Most followers embrace the mission's unique multi-faith creed with its unique symbol. "It was the master (Sadhu T.L. Vaswani) who thought of it. It is a rendition of the ancient Indian symbol Om, which represents the Universal Reality, but it also incorporates other religious insignia—the cross, the crescent, the lotus of Buddhism, and the sun of the Aryans. The paths that lead to God are many but He is one," explains Dada Vaswani. Religion must unite people, not divide them, he teaches, because "if Lord Krishna is my father, Prophet Mohammed and Jesus Christ are my uncles." The mission's emphasis on emotional education has inspired many, who now use these techniques in their work too. Dada Vaswani says: "The present system trains only the head. It produces sharp brains, not illuminated hearts. Education can only be complete when it trains the head, the hands (to serve), and the heart. It is the emotional quotient that leads to the sacrifice quotient, which in turn binds humanity." His ardent followers include the country's movers and shakers. BJP leader L.K. Advani says: "Dada Vaswani is not just a great spiritual leader, he is humility personified. Dada has had a great impact on me and my family. I am inspired by his credo that there should be a moral and ethical base to whatever one does." Says actor Boman Irani, "Meeting Dada was a very humbling experience....I felt elevated. People like me in the films need doses of humility." Adds R.C. Lahoti, a former chief justice, "The biggest lesson I have learnt from him is how to maintain my calm and cool even in adversity". Honoured with the U Thant Peace Award in April 1998, Dada Vaswani has addressed the United Nations, and the House of Commons in London, and has authored more than 75 books on spirituality. He emphasises that peace and harmony will elude us until we "Stop All Killing". The mission observes his guru's birthday, November 25, as "Meatless Day" and Animal Rights Day. "If today I don't hesitate in killing an animal, I won't hesitate in killing a man tomorrow. Life is God's gift, only he can take it away." According to Dada, selfless service equals meditation. The best exercise for the heart? "Reach down and lift up as many as you can." Next Story : What's The Good Word?